Originally thought the Tour of California being scheduled simultaneously with the Giro would have been a fail of catastrophic proportions. It turns out it wasn’t. Today’s stage 1 finish was crazy, chaotic, and exciting. The field was huge, lots of big stars pushing their teams, and the crowds were massive! Cav took it in the end, but JJ looked to have a little juice in the tank to make it interesting. Sad to see Boonen go down, as well as Chris Horner and Stuey O’Grady. In the Giro we’re witnessing some of the more exciting stages I’ve witnessed in a Grand Tour in a long time. 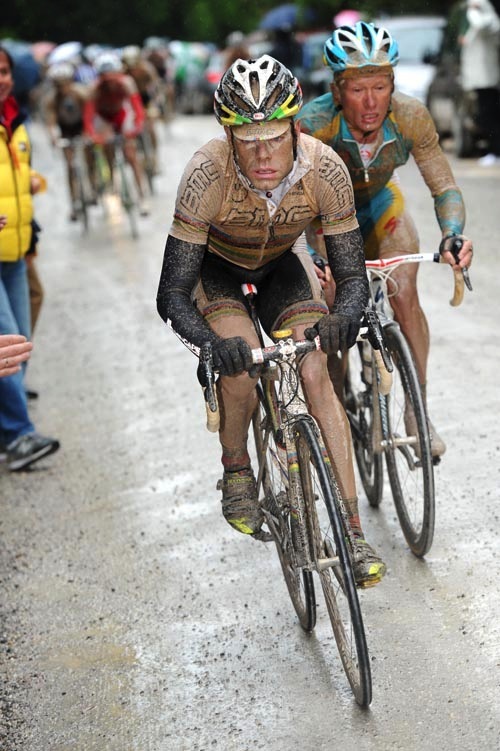 Stage 7 traversing the strade bianche could only be summed up with the overused word, epic. It was a day that legends are born. The fact that Cadel Evans took the stage wearing the rainbow stripes of the World Champion took it over the top in its epicness. Yes, epicness. Needless to say I’m back to being full of amore for the sport of cycling. I’m able to cheer riders again, albeit with reservation as we can never be sure that they’re clean. But at least I’m actively rooting again. On the personal bike side, I’m actually riding regularly. Right now it’s been 2 days a week at best, but that’s the best it’s been for a long time. Soon enough I’ll schedule a few days a week to commute as well, so that should keep the process of decreasing my waistline in proper order. Unfortunately for me, I’m getting older and my recovery time is longer than it was 2 years ago. Legs feel stuffed longer, but I’m hoping that will change as I gain more form. I’m guessing that I completely atrophied at one point so my legs were at a feeble level of strength when I started Spring ’09. I started yet another Tumblr account, this time for this site. The official Cycleboredom Tumblr is live, and I’ve done no HTML/CSS customization (except for some font families). I’ve been wanting to just post images, and other randomness that doesn’t need a full blown WP post like this. So I cooked one up for meself! If everything goes well, sometime next month I should have my Gunnar built. Can’t believe it’s taken so long. I have 9 speed 105 ready for it if you can believe that, but I’m in no position to buy anything new. In those 2 years off from cycling, I managed to acquire a daughter. That’s where all our money goes now. Occasionally I’m able to get something for the bici collection. Lately, everything has gone to clothing considering I’m wearing some kits from 2001! If I have time, I’ll document the build and the outcome. I’m sure the report on how 105 works will be exhilarating to say the least.